Todd with his trusty DICOR! It's still summer, thank goodness, and we are still enjoying the easy days of good weather and long daylight hours. 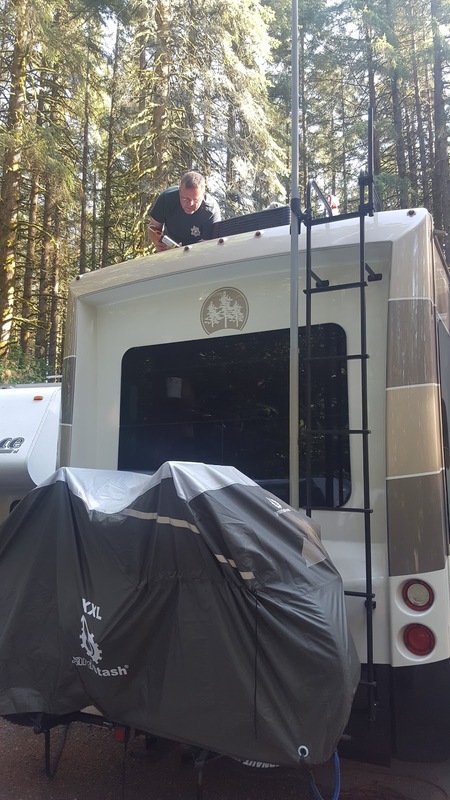 But the early morning and evening chill reminds us that it won't last forever, and even for those of us heading for a warm winter climate, it's important to attend to a few weather-related RV chores that you cannot afford to ignore. One job that is critically important for ALL RV's, no matter what age or type, is to inspect and re-apply caulking. All RV's use caulk to seal the seams of the exterior structure from the most damaging force of all that costs RV owners more money and grief than all other forces combined: WATER! This must be done at least annually (every 6 months is better), and we make sure that late summer signals to us that it is time to check it again. We check it more often than that, but this is the time we do any heavy work that needs to be done. This is one of those many maintenance items that RV's require that are not difficult or expensive, but critically important if you want to preserve your RV for years to come. It only takes a tiny, tiny break in the exterior seal to create a shocking disaster under the skin. Water is wicked continuously into the dry interior through even almost imperceptible openings, where it permeates the interior wall structures and insulation which very quickly will begin to rot and cause mold, delamination and catastrophic, sometimes irreparable damage. 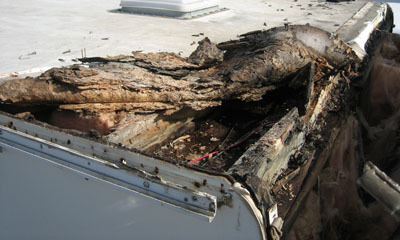 I have seen photos of rot under the skin of an RV that was yet undetectable on the exterior, but the RV was falling apart because of it. Such an easily preventable tragedy! It only takes a short time to get up on the roof and take a good, close look at your sealants. Check every thing, around vents, antenna, vent pipes, anything with caulk around it. It doesn't last forever, especially in hot sun. Find out which product is the correct product for your RV, they vary. If you choose the wrong sealant (DO NOT just buy a tube of silicone!!) 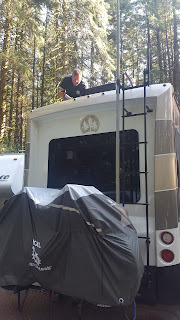 it will not protect your RV and you have wasted time and money. Possibly a LOT of money. Some sealants do not adhere to some types of roofs and materials. Be sure to choose correctly.